You can find wisdom teeth pain relief quickly with the help of the numerous natural remedies we are happy to share with you. Some people never grow wisdom teeth – how lucky of them. The good news is you can soothe the pain that comes with the third set of molars. We’ll discuss more about the troubleing wisdom teeth, the causes of this specific pain, the symptoms, and what you can do to find relief. Look at you, you’re wiser now. Unfortunately, you are also hurting, which is why you are trying to find some wisdom teeth pain relief. Why do we grow these teeth anyway? The name has been given due to the fact that these molars usually emerge between the ages of 17 and 25. However, some grow them earlier or later. Wisdom teeth generally begin forming around the age of 10 but they don’t erupt until years later. They are what scientists call “vestigial organs”. These organs are body parts that today are useless. And it’s all because of evolution. But wisdom teeth haven’t always been unnecessary. These third set of molars are the evolution’s response to the diet of our ancestors. Because they chewed raw meat, nuts, and even roots, they needed more chewing power. As a result, a new set of teeth developed to meet their needs. Since then, humans have learned to cook their foods and use forks and knives to cut the meat. Consequently, we don’t rely on these teeth any longer. Yet we still develop them, and some people grow as much as four wisdom teeth. They often make a painful entrance, an ache that still remains. It’s because, as we evolved, our jaws have become smaller. This is why, when these teeth come out, they have no room to fully erupt. When they only partially erupt, the area is left open to infection and bacterial growth. What are the signs of impacted wisdom tooth? Unpleasant taste when biting down on food. Before scheduling an appointment with your dentist, it’s likely you are in a lot of pain. Fortunately, you can gain some wisdom teeth pain relief thanks to a few home remedies. Instead of rushing down to the local drug store, why not take the all-natural road? One of the most effective ways to stop wisdom teeth pain is to rinse your mouth with salt water. First, you must boil the water and add a few tablespoons of salt in it. Wait until it has cooled to a warm temperature. Then, you can rinse your mouth with it for a couple of minutes. You should notice a significant relief right away. Clove is one of the oldest cures for tooth pain, being used since medieval times. Some even go as far as saying it is the best. There are multiple ways you can use clove. You can place the whole clove near the tooth and bit down on it to release the oils. When you feel a tingling sensation and a bitter taste in your mouth, that’s when the oils have been released. Its analgesic effect is said to last for hours. And don’t worry about the bitter taste, it should subside in a few minutes. Another way would be to use clove oil. Simply rub it onto to tooth and the gums. Onion is another great wisdom teeth pain relief cure if you can stand the taste. Onions have both antiseptic and antimicrobial properties. They can help you get rid of the nasty pain by killing the germs responsible for the infection. However, you might want to use this cure when you don’t have any going out plans later. Take an onion and cut it in half. Place one part on the inside of the cheek, close to the tooth that aches. Leave it there for as much as you can – 10 to 15 minutes should be enough. You can bite down on the onion to release some of the juice. You will see a great improvement if you can stand the strong, bitter taste of the vegetable. This spice is not only a staple ingredient in Indian cuisine, but it is also successfully used to treat toothaches and bleeding gums. Take two teaspoons of lemon juice and add about half a teaspoon of powdered asafetida to it. Warm the solution, then take a cotton pad and apply the mixture to the affected area. Alternatively, you can also fry asafetida in clarified butter and place this solution in the tooth cavity instead. Either way, you should have a quick fix to your problem. Tea tree oil is a miraculous remedy for tons of medical issues. One of its uses is helping clear up tooth pain. No need to mix up a bunch of ingredients or warm the oil. Simply take a few drops of it and rub the tea tree oil directly onto the aching tooth or teeth and the surrounding gums. You should be finding instant wisdom teeth pain relief. Combining salt, pepper, and a bit of water will result in a mixture with antibacterial, analgesic, and anti-inflammatory properties. You can apply the paste directly on the affected teeth. Let it sit for a few minutes before rinsing. If you can find fresh guava leaves, then you’ve found yourself a great natural remedy for your painful wisdom tooth. The leaves have analgesic, anti-inflammatory, and antimicrobial properties that can alleviate the symptoms of the infection. If you need an instant fix, just chew on a couple of leaves until the juice does its job. Additionally, you can also boil about five guava leaves and add some salt to it. This solution can be used daily as a mouthwash to prevent other painful episodes. The humble vanilla essence we use for baking and making ice cream has other purposes you may not know about. While we mostly use it to add flavor to many sweet products, it can also reduce a toothache. All you need to do is take a cotton ball, dip it into the vanilla essence, then place it directly on the aching tooth. Ice cubes are a pretty straightforward remedy for wisdom tooth ache. It alleviates the pain by numbing the nerve endings in the tooth. Here’s how you do it. wrap an ice cube in a thin cloth and hold it on your cheek. Allow a couple of minutes to make its effect. However, if you have exposed nerves, avoid this remedy, as it will only cause more pain. You may already use peppermint for healing a sore throat, but it’s not the only thing it’s good for. Peppermint offers excellent wisdom teeth pain relief. Furthermore, unlike other natural remedies, it has a nice fresh aroma that won’t bother you. To use it for your teeth, you can go with one of the following two ways. First, you can take the fresh leaves and apply them directly onto the aching tooth. Leave them there for about 20 minutes, until you feel relief. Secondly, you can use peppermint extract. Take a few drops on a cotton swab and place it onto the tooth. Leave the cotton swab there for a few minutes, and you should quickly start feeling better. Olive oil is one of the most healing ingredients out there. To use it as a way to ease wisdom tooth pain, you first need to heat it up. Then, let it cool to a lukewarm temperature. Afterward, lie on your side and pour a small amount of oil into the ear that’s on the side where the tooth hurts. Pour just a small amount of olive oil; it will be enough to diminish the pain quickly. 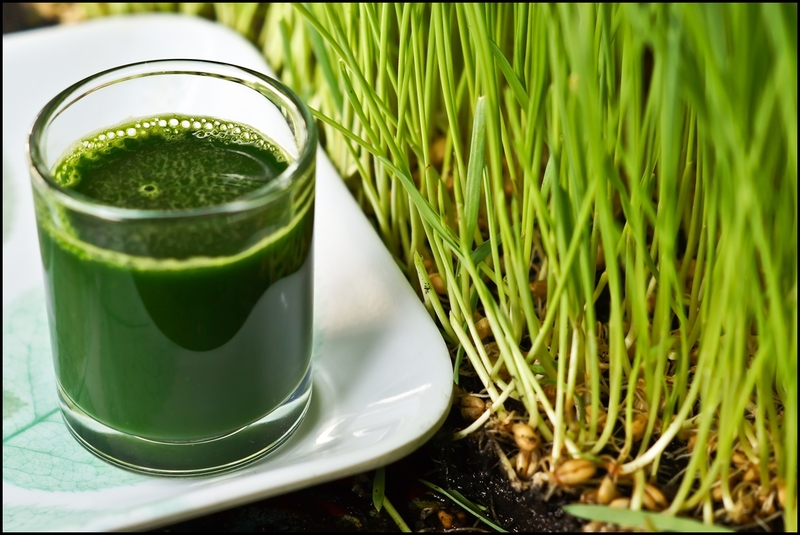 Wheatgrass juice is a potent healer because it packs many minerals and vitamins, and the plant nutrients it contains are thought to possess antibacterial, anti-inflammatory, and antioxidant properties. Take an ounce of wheatgrass juice and swish it in your mouth for a few minutes. It will remove the toxins from around the painful tooth, thus taking away the pain related to the infection. For further relief, you can also take the grass remaining after juicing and put it directly on the troubled area. Raw potatoes are an excellent home remedy for multiple health problems. It can also help you get rid of that annoying toothache in an instant. Put a potato in the freezer for approximately ten minutes until it chills. Then cut a thin slice and put it on your aching tooth. The potato will work by numbing the nerves, thus soothing the pain. Garlic is an equally good wisdom teeth pain relief remedy. It has antibiotic properties that have been proven to work wonders in reducing this type of pain. Crush a garlic clove and mix it with a pinch of table salt or black salt. Apply it onto the affected tooth for an instant alleviation of pain. If you’re in a hurry, simply chew on the glove. Another classic cure for tooth pain, ginger root offers an almost immediate relief. Simply cut off a thin slice of the root of the plant and remove the skin. Place the slice of ginger root on the painful tooth, biting down gently. Do this for about 10 minutes. This all-natural method works every time.